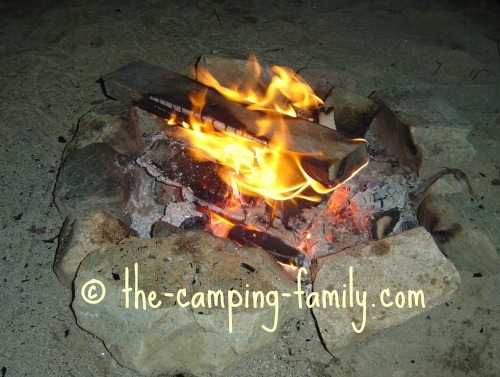 Making roasted marshmallows over a campfire is one of the best things about a family camping trip! Here's how to make roasted marshmallows. If you will be hunting for actual sticks, find and sharpen them in advance. Don't wait until dark! 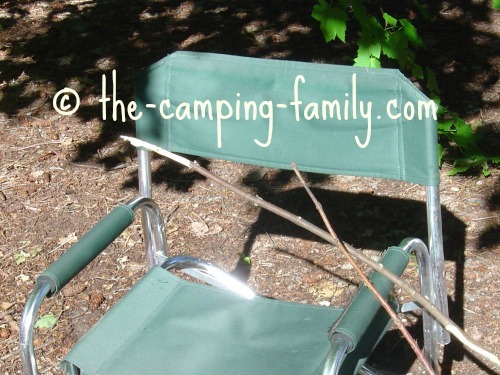 If you have brought marshmallow forks or sticks from home, put them where you'll be able to get at them easily. There are lots of different types of marshmallow roasting sticks. Read about the options here. There will be sticky fingers! Have cleanup supplies handy. Here is how to make homemade baby wipes. Don't wait until you are ready to roast marshmallows to build your fire! Do it an hour or so ahead of time. It will need time to burn down to perfect marshmallow roasting coals. When the coals are ready, poke the end of a marshmallow stick into a marshmallow. Position the marshmallow several inches above an area of red hot glowing coals. Keep the marshmallow away from any flames (unless you like them charred). Choose your preferred technique (below). 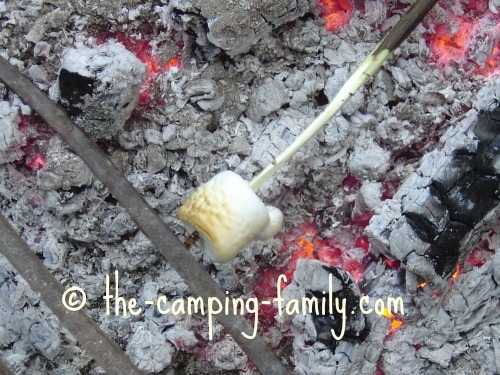 When your marshmallow is cooked to perfection, eat it - or use to to make a Smore. 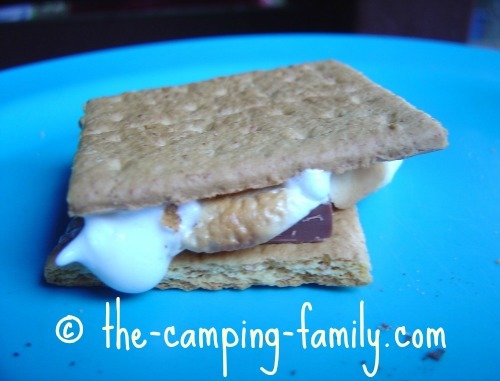 Click here to learn how to make Smores. Some people like to keep their marshmallow rotating constantly, like on a rotisserie, so that every side gets the same amount of heat. I prefer the "hold and rotate" method myself. I hold the marshmallow steady over the coals until one bit is perfectly brown and toasty. Then I rotate the marshmallow a quarter turn and begin roasting the next bit. Either way, your goal is a marshmallow that is golden brown and just slightly crispy, all the way around. Then they peel off the burnt bit, throw it into the fire and eat the hot liquid inside. Some people even like to eat the entire charred mess. I can't imagine why! 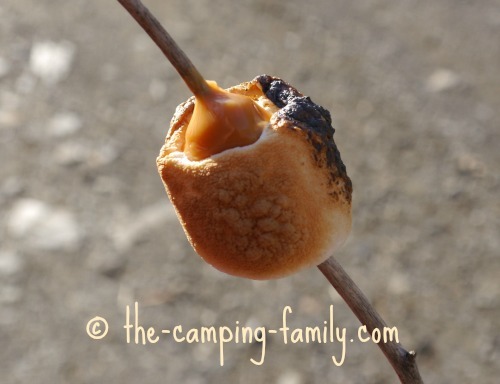 If you want a really decadent treat, put a caramel candy on the stick above your marshmallow. When both the marshmallow and the candy are soft, slide the marshmallow up so that it covers the candy. Close adult supervision is required when children make roasted marshmallows. Sometimes a marshmallow will get too close to the fire and burst into flames. A child's automatic response may be to yank the stick out of the fire. You don't want a blazing fireball waving around the group! Teach your child to carefully withdraw a burning marshmallow from the fire, and quickly blow out the flames. Roasted marshmallows are a treasured campfire tradition. Since there is nothing nutritious about marshmallows, we save them for occasional special treats. For a healthier campfire treat, try making banana boats. Here's an easy banana boat recipe. Now that you know how to make roasted marshmallows, click here to learn more about campfire cooking. 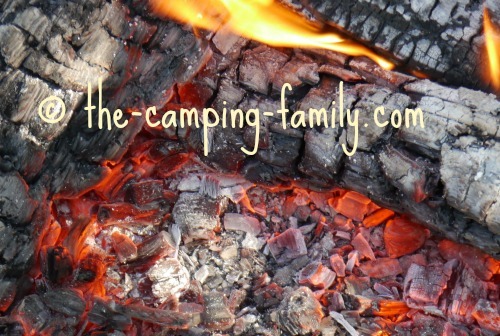 Before you plan your next camping trip, visit The Camping Family home page. 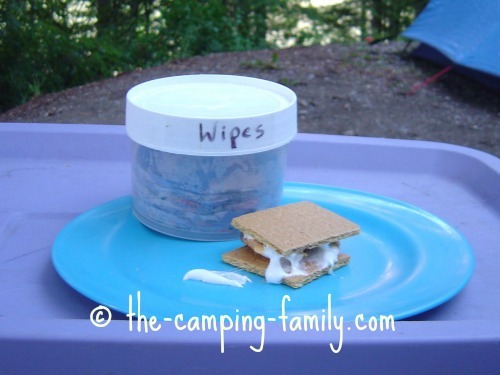 You'll find great camping food ideas, packing lists, camping tips and more!